St. Petersburg, Russia’s second city, boasts a plethora of must-see landmarks. Orient yourself and see the city’s architectural highlights on this private walking tour, ideal for first-time visitors. Tick off Nevsky Prospekt, one of Russia’s most famous streets, St. Petersburg Palace Square (Dvortsovaya Ploshchad), and the iconic Peter and Paul Fortress, a 300-year-old citadel home to royal tombs and museums. Hotel pickup and drop-off and admission tickets are included. Your half-day sightseeing tour begins with hotel pickup at, when you’ll board a climate-controlled vehicle destined for St. Petersburg’s top attractions. Stop first at St. Petersburg's principal street, Nevsky Prospekt, to admire the grandeur of the Admiralty and the Alexander Nevsky Monastery. 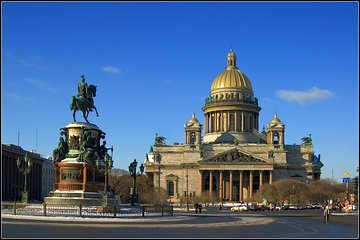 See, too, St. Petersburg Palace Square (Dvortsovaya Ploshchad) and the majestic St. Isaac’s Cathedral. You’ll have around 15 minutes to stop and take photographs at each major sight. The tour culminates with a visit to the Peter and Paul Fortress, an iconic citadel built to prevent St. Petersburg from attack. Gaze at the magnificent Peter and Paul Cathedral, wander along the sandy shores of the Neva River, see tombs belonging to Russian monarchs, and see the former prison cells that incarcerated Feodor Dostoevsky, Leon Trotsky and Maxim Gorky. Your tour concludes with hotel drop-off. Our guide was excellent and he made us love St Petersburg right away. No more to say.